Two patients died after feeding tubes were inserted into their lungs instead of their stomachs, an inquest has concluded. Michael Parke and Amanda Coulthard died from infections caused by inhaling food, at hospitals run by North Cumbria University Hospital Trusts. At an inquest in Cockermouth, chief coroner David Roberts said both patients had been neglected by staff. Recording narrative verdicts, he said the trust's policy was "shambolic". Mr Roberts said he had written to the government and NHS England to ensure issues identified in Cumbria were being addressed. 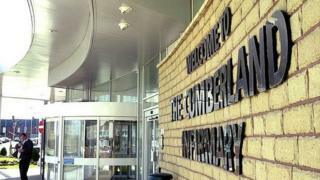 Mr Parke died in Whitehaven's West Cumberland Hospital in 2012 and Mrs Coulthard died at Carlisle's Cumberland Infirmary in 2015. Nasogastric tubes, which allow nutrients to be sent directly to a patient's stomach, were used in both cases. In the lead-up to the death of Mr Parke, of Cockermouth, the coroner said there had been a "shambolic implementation" of a new policy regarding the tubes. He said Mr Parke died as a result of systematic neglect. Mr Roberts said Mrs Coulthard, of Penrith, had suffered neglect when nurses failed to correctly record test results. Stephen Eames, chief executive of North Cumbria University Hospitals Trust, said: "We expect high standards of patient care at all times... these were not met for Michael or Amanda and we sincerely apologise for this. "As a direct result of these incidents I'd like to reassure the public that we have taken action to ensure this does not happen again."